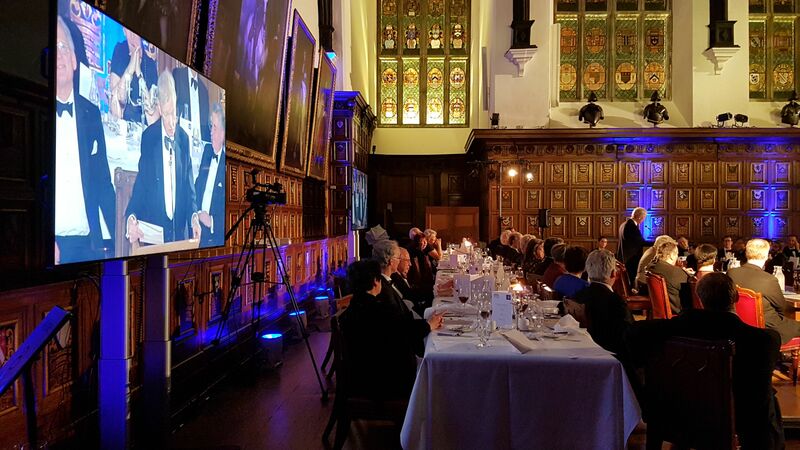 The London Audio Visual team have built a strong relationship with The Middle Temple staff and over the years we continue to provide audio visual equipment for their events. The initial brief for this event was to provide a sound system and live camera feed to screens for the audience to enjoy the presentations. The client also wanted a recording of the event for online use at a later date. To check what video services we offer click here. The equipment required for this set up included, 95” screens on motorised lifts, Source 4 lights, Sony NX5 HD cameras, Roland V800 vision mixer, QL1 Digital audio desk, gooseneck tabletop mics, wireless lapel mics, room uplighters. The 95″ screens were the perfect choice for the size of the hall, it allowed all guests to have a clear view of the speaker, connected via our live feed. The room uplighters were set in a blue light tying in with the event theme, whilst not taking away from the historical beauty of the building. The client opted for the gooseneck mic as well as the lapel mic, to allow speakers the freedom to move around. To further enhance the client’s brand they opted for their logo to be displayed on the screens when there was no camera feed necessary. Due to prior planning and our on going relationship allowing us to use our previous site knowledge, the set-up took approximately three hours. Our site technicians controlled the lighting, sound for the room as well as the recording, the two cameras and the vision mixer, which was also streamed to the two large screens and the recorder. Our crew thoroughly enjoy working in such a magnificent building. 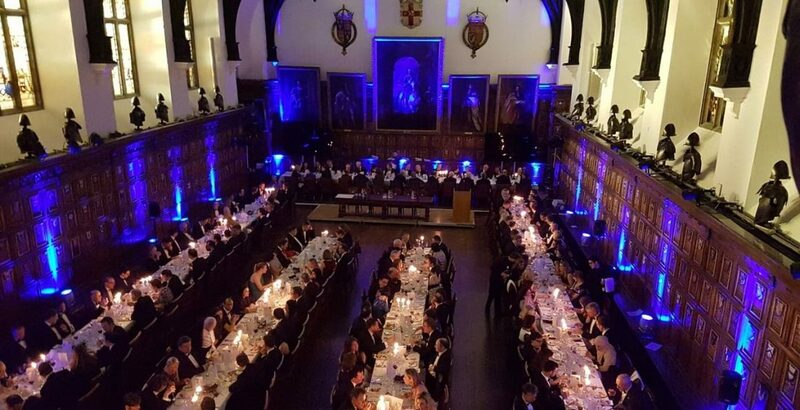 Take a look at past work, which London Audio Visual have been privileged to take on for the Middle Temple event team, by clicking here.